Governor Reynolds of Iowa has issued a statewide State of Emergency due to flooding and/or potential flooding in the coming weeks. The current impacts are mostly in western Iowa near the Missouri river, however additional rivers may be impacted as rain continues to fall on top of snowpack. 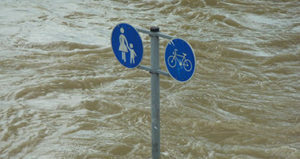 Ice jams are likely to occur, meaning rivers and streams may rise is a very rapid rates. Road closures can also be expected. Governor Ricketts of Nebraska has issued a statewide State of Emergency due to flooding and potential flooding impacting central and eastern Nebraska. Additional areas may be impacted as rain continues to fall onto the rapidly melting icepack. Ice jams will also likely occur, resulting in rivers and streams rising at very rapid rates. Three shelters are currently open with approximately 100 occupants, though that number will likely increase.